Pesto and pasta go together perfectly, and there’s nothing better than homemade pesto! Originally, pesto was made by pounding the ingredients in a mortar and pestle, but if you have a food processor, you can make pesto in a flash. The basil, Parmesan, garlic, pine nuts, lemon juice and olive oil marry their flavors perfectly for a taste explosion. You can use pesto as a pasta topping, eat it with pizza, or add to a sandwich for some extra zing. Toast the nuts or seeds for extra flavor, but this step is optional if you’re pushed for time. In a medium skillet, toast the nuts/seeds over medium heat, stirring frequently (don’t let them burn), until nice and fragrant, around 3 to 5 minutes. Pour them into a bowl and leave until cool. 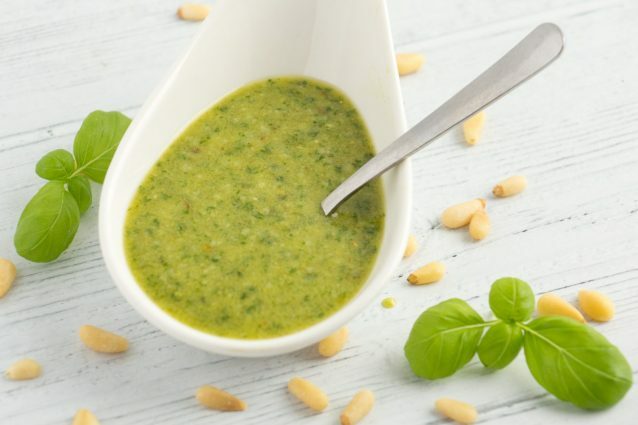 To make the pesto, combine the basil, cooled nuts/seeds, Parmesan, lemon juice, garlic and salt in a food processor or blender. With the machine running, slowly drizzle in the olive oil. Continue processing until the mixture is well blended but still has some texture, pausing to scrape down the sides as necessary. Taste, and adjust if necessary. Add a pinch of salt if it tastes too bitter, or add more Parmesan if you’d like a creamier/cheesier pesto. If desired, you can thin out the pesto with more olive oil, but I find this amount gives a nice consistency for using on pasta. Store leftover pesto in the refrigerator, covered, for up to 1 week. 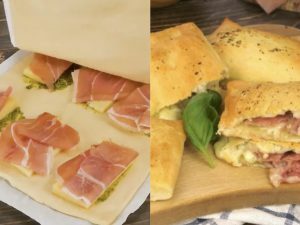 You can also freeze pesto – and ice cube tray is ideal. Once frozen, transfer to a freezer bag, then you can thaw only as much as you need later. To make the pesto vegan or dairy free, replace the Parmesan with 1 tablespoon nutritional yeast. If you want to avoid nuts, use pine nuts, pepitas or sunflower seeds. Be aware that pine nuts are technically seeds, but if you’re allergic to nuts, there’s a chance you’ll be allergic to pine nuts, too. Most Parmesans are not technically vegetarian as they contain animal rennet, but Whole Foods 365 and BelGioioso brands offer vegetarian Parmesan cheese. Before you drain your pasta, place a liquid measuring cup in the sink. Then, pour about 1 cup of the pasta cooking water into the measuring cup before you drain off the rest of the water. Once off the heat, toss the pasta, pesto and small splashes of pasta cooking water together until you’re satisfied with the consistency (I use roughly ⅓ cup reserved pasta cooking water for ½ pound of spaghetti).